Jacob Philipp Hackert’s painting, Fireworks over Castel Sant'Angelo in Rome, 1775. Image courtesy of Wikimedia Commons. By the 16th and 17th centuries—when men like Copernicus, Kepler, Galileo, and Newton were devising a novel way to understand the world—fireworks had already made their way from China to Europe. Princely courts across the continent sponsored extravagant displays to celebrate royal weddings, military triumphs, and other occasions. A community of gunners—the men who managed the newfangled technology of gunpowder and firearms—distinguished themselves by creating ever more exciting and ingenious effects. Following the ancient notion of the four elements—earth, air, water, fire—they placed candles and fountains on the ground, shot rockets and fireballs up into the sky, and positioned rockets to bob up and down on a river before shooting up. Fireworks were thought to be imitations of celestial phenomena. To control them, as the prince who ordered a display appeared to do, signaled great power. 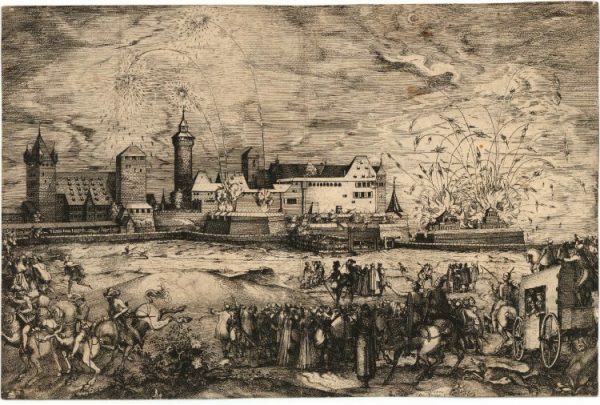 A 1570 print showing fireworks at Nuremberg in honor of Emperor Maximilian II. Image courtesy of the British Museum. Among the audiences who watched these shows were “natural philosophers”—as scientists were then known. They observed carefully the brilliance with which gunners imitated nature. Dissatisfied with traditional ways of learning about nature through reading ancient texts, these natural philosophers reasoned that artisans might offer a better model. Artisans had a “hands-on” approach to things and achieved practical results from what they knew. “Experiment” was the name natural philosophers gave to their own, erudite version of the approach. Like artisans, they would learn how to experiment with nature to generate impressive effects, but in doing so they would study carefully how things worked and try to come up with general conclusions about the processes involved. Arts and crafts helped in this way to nurture the birth of modern science, and fireworks were one of the crafts that helped to make this happen. 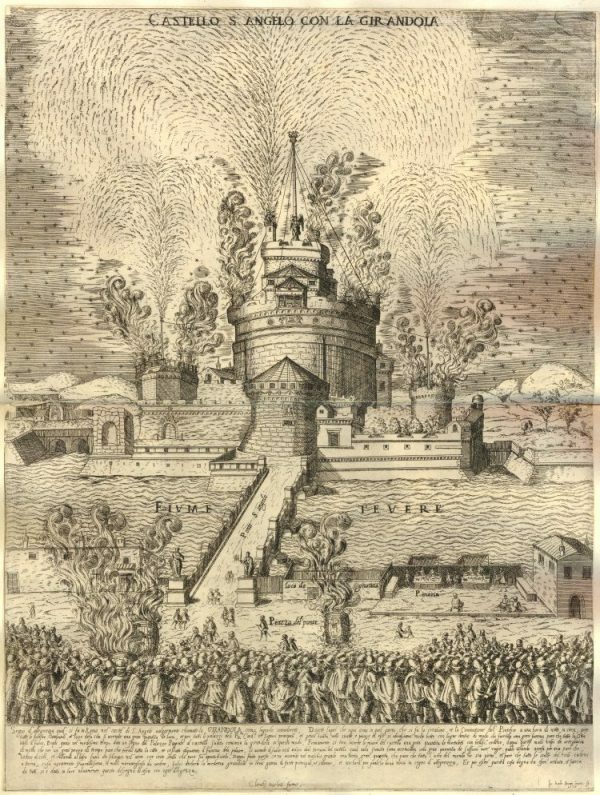 A 1579 print showing fireworks at the Castello Sant’Angelo in Rome. Image courtesy of the British Museum. What about human beings? Pyrotechnic methods and models helped inspire what was known as the “mechanical philosophy”—explaining things by reference to some kind of physical or chemical mechanism that generated a natural effect. One dramatic idea that emerged from thinking about fireworks was that life itself was a pyrotechnic phenomenon. In fireworks displays, gunpowder moved figures of men and women, animals and monsters. Did similar mechanisms animate real bodies? In the 17th century, a school of “nitro-sulphureous” philosophy argued just that. Tiny particles of some nitrous and sulphurous substance, like the niter and sulphur that were key ingredients of gunpowder, must somehow be present inside the muscles, flesh, and blood of living things. They react together and “explode” to generate the movement and life that characterizes living beings. Later on, an electrical version of this theory proposed the idea of a “spark of life”—present most infamously in Frankenstein. The new approach to science that fireworks supported—experiments, hands-on methods—was, in general, tremendously successful. By the 18th century, “natural philosophy” was all the rage. Ladies and gentlemen busied themselves with telescopes, air pumps, and microscopes, gathered to discuss the latest scientific news, and published accounts of their experiments in a new genre of scientific journals. Discoveries proliferated—the discovery of different gases like hydrogen and oxygen, for example. As more and more was learnt about nature, these discoveries in turn enhanced fireworks. 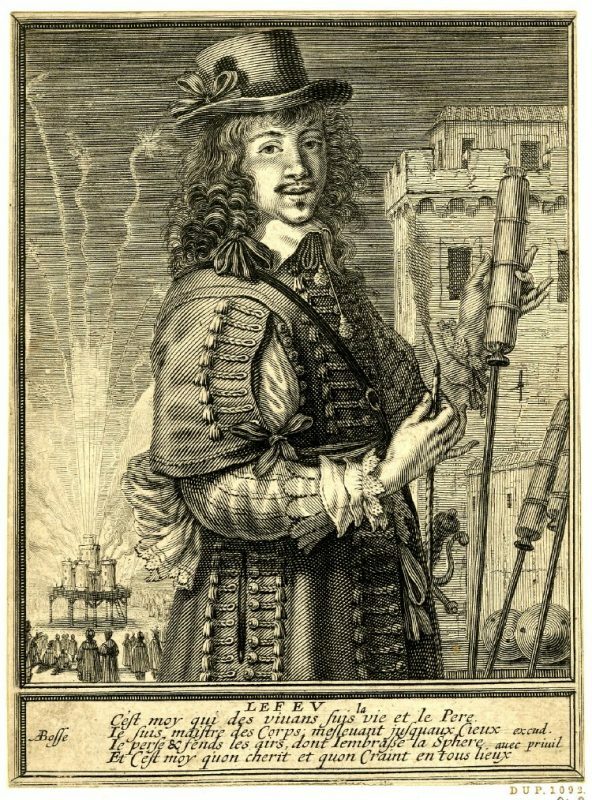 A 1630 print showing a man holding a rocket with fireworks in the background. Image courtesy of the British Museum. One example is “philosophical fireworks,” the unmissable London spectacle of 1788. These shows used inflammable gases to create an imitation fireworks show inside theaters. Other imitation fireworks shows that drew on the latest discoveries included optical fireworks, made with lenses and mirrors, electrical fireworks made by shooting sparks across foil paper arranged in letters and figures, and chemical fireworks, which used newly discovered elements and compounds to create effects. By the 1830s, chemistry also gave fireworks their brilliant colors, shining with yellows, blues, reds, and greens, thanks to the use of a new substance, potassium chlorate, which burned with metal salts to give bright colored flames. Science was paying back the debt it owed from a century before. Just as fireworks contributed to the birth of modern science, so science was now shaping the birth of modern fireworks, the kinds of displays we see today. 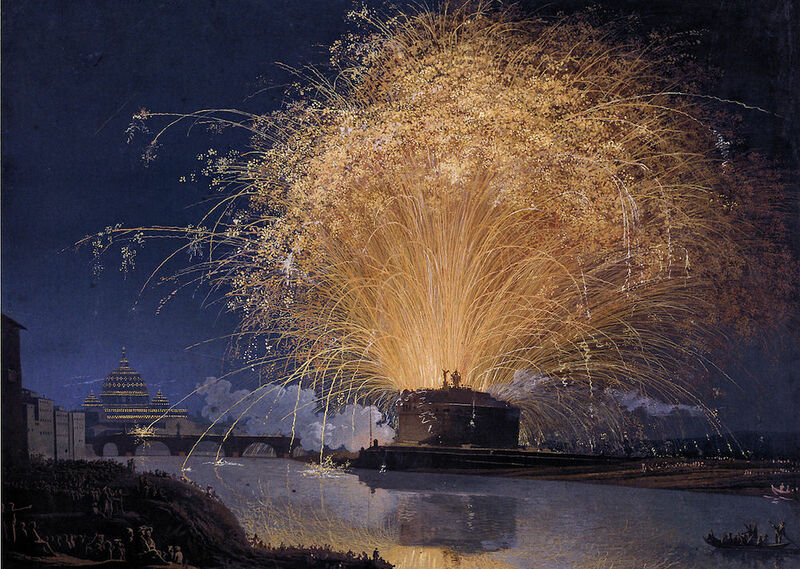 The meaning and context of fireworks also changed as old ideas about the natural world faded. The ancient notion of four elements died away, and with it the division of fireworks into air, earth, and water. Aquatic fireworks disappeared in the 18th century, and while fireworks set off on the ground are still with us, today it is fireworks of the air that predominate. Fireworks in princely courts also declined after the French Revolution, so that fireworks became more and more a commercial, not a royal, enterprise. Commercial logic did away with expensive stage scenery, automata, and decorations, and replaced them with ever-changing, abstract patterns of color and light. Audiences lost none of their delight at such displays and science continues to revolutionize fireworks: witness the advent of computer programming in recent decades to precisely control the timing and coordination of displays. But this has not always been the case. In the past, fireworks helped to revolutionize science. Perhaps one day fireworks will again inspire scientists in their understanding of the natural world. Simon Werrett teaches the history of science at University College London. He has written widely on pyrotechnic history and is the author of Fireworks: Pyrotechnic Arts and Sciences in European History (Chicago University Press, 2010).